Ramon, author of The Coworking Handbook, has kindly invited me to guest post here with some tips to help coworking space owners and managers get more local publicity. His coworking space in Brussels was my company Prezly’s home for years. We built the first versions of our PR software there and watched our company grow from a tiny startup into a successful business. We recently moved to our own office, but I look back on our time at Betacowork with many great memories. This is my opportunity to give back. Over the next few weeks, I’ll share hard-earned advice to help you spread the word for your coworking space, using the same techniques that many modern and expensive PR agencies use. This week, I’ll introduce you to social media press releases, why they matter, and how to create them – it’s easier than you think. Let’s start with the basics. What is a press release, anyway? At its simplest level, a press release is a story that you tell about your brand, such as the launch of your new coworking space or the results of a survey you’ve conducted about the ways people work in your city. A social media press release goes one step farther. In addition to text, social media press releases contain video, images, and anything else that will help journalists discover, share, and write about your story. Here’s an example. 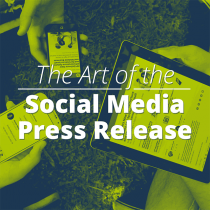 Quite simply, social media press releases outperform plain text releases. By a lot. Because they’re hosted online rather than inside a pitch email, journalists and consumers can find your press releases via search, link to them, and share them on social media. The resulting bump in views is far from trivial. In fact, two-thirds of traffic to press releases comes from social and search. Adding multimedia, such as a photo of your coworking space and video interviews with people who work there, can boost your traffic even more. A study from PR Newswire found that press releases containing multimedia assets get up to 9.7 times as many views as text alone. Content editors and journalists know this. They’re already under pressure to include more visuals in their articles, so give them what they want. You’ll increase your odds of getting coverage, you’ll gain trust with your influencers, and your story will be more engaging to readers. At this point, you may be thinking that social media press releases sound great, but how much work does it really take to create them? Luckily, it’s not as hard as it sounds. Here are a few tips to help you make them awesome. Write a great headline. The headline is the first thing a journalist sees. Make it good, or they may not read any further. You should also make sure it’s tweetable, so keep it to 140 characters or less. For more great advice, check out this short guide to writing catchy headlines. Get straight to the point. Address your most important point in the first paragraph of your press release. Keep the rest of the release to two pages or less. One page is better. Back up your story with hard numbers. Facts and statistics will make your story stronger. Use them. But first, double-check your sources to make sure they’re credible. Include quotes. A good quote will make your story more interesting and human. Quotes can come from people inside or outside your company (or both), as long as they’re relevant. Add share buttons. Make it easy for readers and journalists to share your press release by calling out share buttons, retweetable phrases, and anything else you want them to share. Make it mobile-friendly. Many journalists read pitches on the go, so make sure your press release looks as good on a mobile screen as it does on a monitor. We’ve made it easy for you with this downloadable mobile template that makes your press release look great on smartphones, tablets, and desktop monitors. Provide contact information. This one sounds obvious, but it’s also easy to overlook. Include a name, email address, and phone number on every press release so journalists can easily contact you for more details. Use high resolution images. High resolutions images will make your press releases look beautiful and professional. They look great in print, too, which makes life a lot easier for journalists who no longer need to ask you for printer-friendly images. Follow these tips, and you’ll be well on your way to telling a great story about your coworking space, one that journalists and influencers will actually want to read and share. Congrats! You’ve reached the end of the first article. Hopefully this means you’re really interested, in which case I’ve got good news for you.. At the beginning of this post, I mentioned that I make software for PR professionals. It’s called Prezly, and it lets you create and publish social media press releases. If you have a coworking space, I’d like to help you out. You can use my software for 3 months at no charge. Just sign up for the free trial on our website, then send us a quick email to let us know that you’re running a coworking space. Next week, I’ll share a complete guide to adding visual content to your news releases, including a list of simple and inexpensive tools you can use to source and even create your own images, infographics, and videos.